WHAT IS A MALU BUCK? 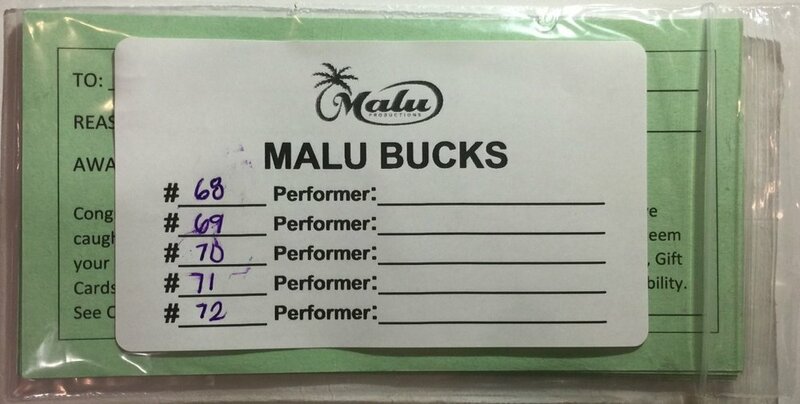 A Malu Buck is company money that LCs & OSM will award to our performers. These Malu Bucks allow them to purchase items from our MALU STORE for free. HOW DO WE AWARD A MALU BUCK? As an LC or OSM, you will be given 5 MB each month. At anytime when you are LC or OSM at a show, should you see a performer or Malu Cast Member "stands out" or go "above and beyond" the standard expectations, then please award the person a MALU BUCK. -DO make sure the person you are awarding was a good worker throughout the entire show, and not just 5minutes or an hour! -DO publicize it! We want all cast present when announcing a Malu Buck award! Make it good! We want them to feel special. -DO select from all MALU cast members including Musicians, Dancers, Fire-Knife Dancers, Sound/Lights, Kokua, etc. HOW AND WHEN DO I AWARD IT? All OSM’s and LC’s will be given 5 Malu Bucks each every month. They will be numbered on the backside so we can track them. You may each award 1 cast member per night/show if you choose to. It will be your responsibility to log all info needed to account for all Malu Bucks. To redeem their MALU BUCKS or purchase items, they have this link on their cast page to our MALU STORE. HOW DO WE (OSM & LCs) GET A MALU BUCK? OSM, Admin, and Kama's can award a MALU BUCK to LCs. Admin, LCs, and Kama's can award a MALU BUCK to OSMs.